A report commissioned by the United Way of Greater Los Angeles and civil rights groups is recommending sweeping changes in the way Los Angeles Unified recruits, hires, evaluates, and pays teachers, as well as substantial changes in state laws in areas such as tenure and seniority rights that obstruct teacher effectiveness. The report will prove instructive to other California districts whose union contracts and personnel polices are similar to LAUSD’s. “The task force recommendations were very good, but now we are asking for acceleration,” said Alicia Lara, vice president for community investment of the United Way. She said that the partnership with parent and community groups, including the Los Angeles Urban League and the Mexican American Legal Defense Fund, will include an advocacy campaign to keep information in the report in the public’s eye. ** The coalition will present findings to the LAUSD school board today. “Teacher Quality Road Map: Improving Practices and Policies in LAUSD” not only criticizes state laws and terms of the teachers contract but also the district itself for not acting on the flexibility it has had within laws and the contract to make wiser hiring practices and staffing decisions. The report offers two dozen recommendations in five areas: staffing, evaluations, tenure, compensation, and work schedule. But Kate Walsh, president of the National Council on Teacher Quality, said improvements in many of those areas – policies affecting transfers, pay, layoffs – hinge on more effective evaluations. Deasy recognized that as well, in making a new evaluation system his first priority. United Teachers Los Angeles is seeking an injunction to stop a volunteer pilot test of the program involving 900-plus teachers in 91 schools. “I hope that we would all see the report (by NCTQ) as an opportunity to reflect on the way to move forward. I am worried that we will become mired in political moves to prevent improvement of teaching,” Deasy told me. Very few teachers received a negative evaluation last year (click to enlarge). One message that was clear from the report, which included a survey of 1,317 teachers and 247 principals, is that everyone wants a different system. More than half of teachers reported they got no feedback or feedback once a year from their principals. 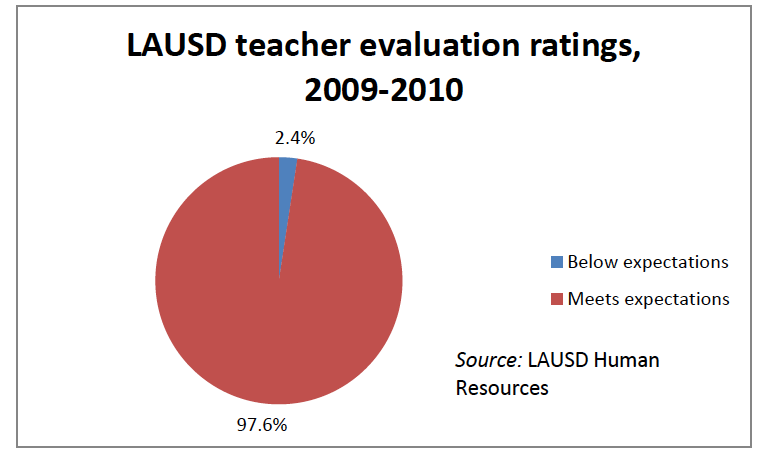 Los Angeles Unified is one of a handful of the nation’s largest urban districts that, as required by state law, have a binary evaluation system that labels teachers as meeting or not meeting expectations. Last year, only 2.4 percent of teachers got a negative rating, and 79 percent got a passing rating on every one of 27 criteria used. And yet 68 percent of teachers said there were teachers in their schools who should be dismissed for poor performance. One-third of principals said they didn’t try to dismiss a poorly performing teacher because the process probably wouldn’t lead to a dismissal. Here are the report’s major findings and recommendations, some requiring contractual changes or legislative action and some inviting independent action by the district itself. Sacramento: Allow performance to be used as a factor in determining which teachers will be laid off. California is one of only a dozen states mandating layoffs by seniority. Other states allow districts to set their own criteria or make seniority one of several factors. Sacramento: Expand California’s “lemon law,” which allows principals to refuse teachers voluntarily seeking a position in a low-performing school, to all teachers involuntarily seeking new jobs because of layoffs. Sacramento: Permit districts to dismiss displaced teachers who are unable to secure a new assignment after one year (they’d be on the district payroll for that year, however. Under the current financial crisis, districts are likely discouraging paying any teachers to sit out). Contract: Eliminate the priority placement list based on seniority that forces principals to accept teachers who aren’t a good fit for their schools. On its own: Move up the June 30 deadline when teachers must notify principals if they are returning. That would give the district a head start on hiring for the fall. As it is now, LAUSD loses good candidates to charter schools and other districts and ends up hiring most new teachers in July and August. Deasy says the district has made progress during the past year, although the report notes that the hiring problem is particularly acute in poor schools. On its own: Educate principals in low-performing schools that they have some flexibility in rejecting priority-list teachers who won’t be a good match. On its own: Require prospective teachers to present lesson plans (hard to believe, the district doesn’t). Contract: End salary differentials for earning course credit for new teachers and use the savings to award teachers bonuses for effectiveness. 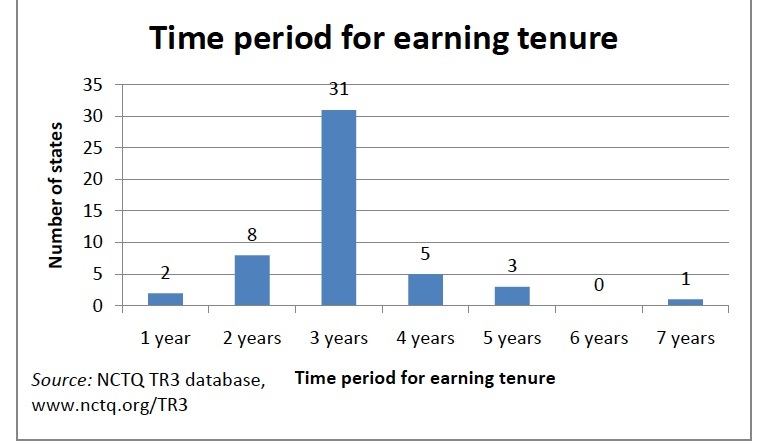 Contract: Give a big raise to teaches who earn tenure, provided the state law determining tenure is changed. Contract: Offer higher salaries to top teachers who consistently produce the greatest learning gains. On this point, Deasy told me he disagreed with the report’s recommendation that student academic growth be the preponderant factor. It should be a factor but not the major weight, he said, and there should be additional ways to reward excellence in teaching besides pay, though he would not specify because they are under negotiation. 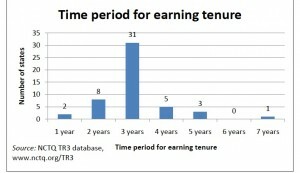 California decides whether to grant tenure – due process rights – after only two years on the job, with notification on March 15 of the second year – the third shortest date in the nation and not enough time to make an informed judgment in many cases, the report said. Sacramento: Extend probation to four years or, failing that, the right to extend probation beyond two years as an option. On its own: Only 2.5 percent of probationary teachers receive a bad review, the same as tenured teachers. Therefore, hold a formal review in which principals and teachers present evidence of performance. On its own: LAUSD teachers tend to use up all of their sick days, nearly 10 per year (6 percent of the school year). They should be required to report absences to a school-level administrator. Contract: Create more collaboration time by requiring that the 8-hour contractual day be spent at school (this mainly affects elementary teachers, who can leave earlier to do work at home). LAUSD, like other districts in California, appears limited by the state’s Stull Act, which sets the two evaluation categories, meeting or not meeting requirements for the job. However, the district could be doing more on its own to give teachers more feedback – and earlier in the year, when suggestions would be useful. Deasy pointed out what the study confirmed: In the last year, there has been a sharp uptick in the number of low-performing teachers who have been let go or counseled out of the profession. Sacramento: Require annual evaluations for all teachers. The minimum frequency of evaluations under the Stull Act has become standard in most districts, with some veteran teachers being evaluated every five years. Sacramento: Enable teachers without an administrator’s credential to do peer evaluations. This would enable teachers with subject expertise to participate in classroom observations. Sacramento: Make the evaluations a management right not subject to negotiation with the union or poor ratings on various criteria the subject of grievances. On its own: Include student feedback as part of evaluations. Contract: Make student performance the preponderant criterion on which teachers are evaluated. This could be the most contentious recommendation. The proposed evaluations criteria for LAUSD would make students’ academic growth account for 30 percent of a teacher’s evaluation, although standardized tests might not be the sole measure. Teachers and principals surveyed greatly disagreed, with 60 percent of principals favoring the use of student achievement as the single most important change and nearly the same percentage of teachers surveyed favoring additional classroom observations, including those by teachers with content knowledge. The report mentions a system adopted by New Haven, Conn., in which half of the evaluation is based on observations and half on student growth measurements. A big disparity between the two generates an automatic review by the central office, and teachers who get the lowest or highest rating automatically are reviewed by another evaluator. Kate Walsh of NCTQ said that two large urban districts, Baltimore and Seattle, altered their teachers contracts significantly after receiving a NCTQ study of their practices, and she is expecting significant changes in Boston as well. In each case, NCTQ was hired by community organizations, like the United Way, and not by districts or unions. ** The report was partially supported by the Bill and Melinda Gates Foundation. Los Angeles Unified Superintendent John Deasy was asked to talk about a career failure during a breakout session Wednesday at NewSchools Venture Fund’s annual Summit in Burlingame, the Lollapalooza for education reformers. Deasy talked about his first effort to move forward a multiple-measure teacher evaluation system combined with tenure and teacher compensation reform while superintendent in Prince George’s County, Md. This was years before the Obama Administration pushed the issue in Race to the Top and Secretary of Education Arne Duncan put it at the top of the agenda in a labor-management summit in Denver. Shift to May 2011, and Deasy, one month on the job, has context working for him: New teacher evaluation systems are being rushed forward in many states – in some ways wisely; in many cases, using test scores as the predominant factor, not. The Teacher Effectiveness Task Force, created by Deasy’s predecessor, Ramon Cortines, has proposed a new teacher evaluation process, along with differentiated compensation, new tenure laws, and an end to layoffs strictly by seniority. Deasy has district trustees behind him. And Los Angeles is a lead district in California Office to Reform Education, or CORE, which had made collaboration on teacher evaluations a priority. By his own admission, in the caldron that is LAUSD politics, Deasy said he has little time: six months, at the most a year on the job, to make good on his stated priorities, or good will and trust will dissipate. Revamping evaluations is at the top of the list. Other districts have moved deliberately on evaluations, but the reality of LAUSD politics, he told me, is that his board faces reelection in 18 months, and the mayoral election is less than two years away. Time is ticking. “What matters is to do what you say you are going to do – and be transparent about how you did it,” he said. Improving safety in schools (lowering violent and non-violent suspensions by about 20 percent). Within a day or so, Deasy will release the numbers and names of schools that have agreed to pilot the multiple measure evaluation system that the district has been drafting. How students perform on standardized tests will be one of many benchmarks. The pilot program next year will be low stakes – teachers won’t be held to the results, and teachers facing discipline action won’t be included. Deasy says the contract with teachers permits this, but he knows UTLA will oppose, possibly fight, the pilot program. They may make the difference if Deasy is to avoid the resistance and failings he encountered years ago in Maryland the first time around.